Like many rural areas, the south side of Kachemak Bay doesn’t get traditional mail service. Instead, its communities rely on a mail boat to deliver to small postal drop offs. It’s the kind of job that attracts a special type of person who’s willing to make the trek across the bay, rain or shine, snow or ice, twice a week, every week, year-round. There the mailman takes the shape of a 60-something ex-fisherman who’s been on the job for nearly 30 years. 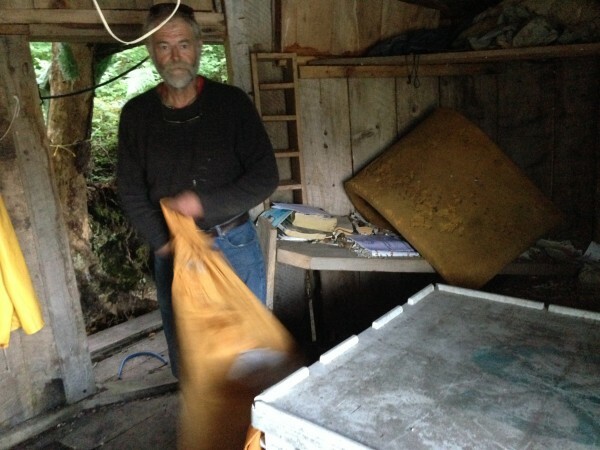 Dave Seaman has been the Tutka Bay mailman for almost 30 years. Photo: Shady Grove Oliver. Dave Seaman lives up to his name. He’s a lanky 60-something fisherman. He wears durable pants and old sweaters and sets his week around the mail. We meet at the Homer post office to pick up the mail. He doesn’t really like town. That’s why he lives across Kachemak Bay in Little Tutka, his one stop on today’s mail route. When he shows up, he brusquely walks in the back door, punches his time card, and heads straight for a tray marked ‘RED MOUNTAIN,’ the name given to the mail drop for Little Tutka back in the day of the old chrome mine, which has since shut down. In recent years, the name has been reduced to the code RDO, a casualty of modern technology. He tosses mail in different piles. He knows to forward a few letters to Homer addresses for Tutka residents summering in town. He stuffs everything into a large yellow mail bag and hightails it out the door. 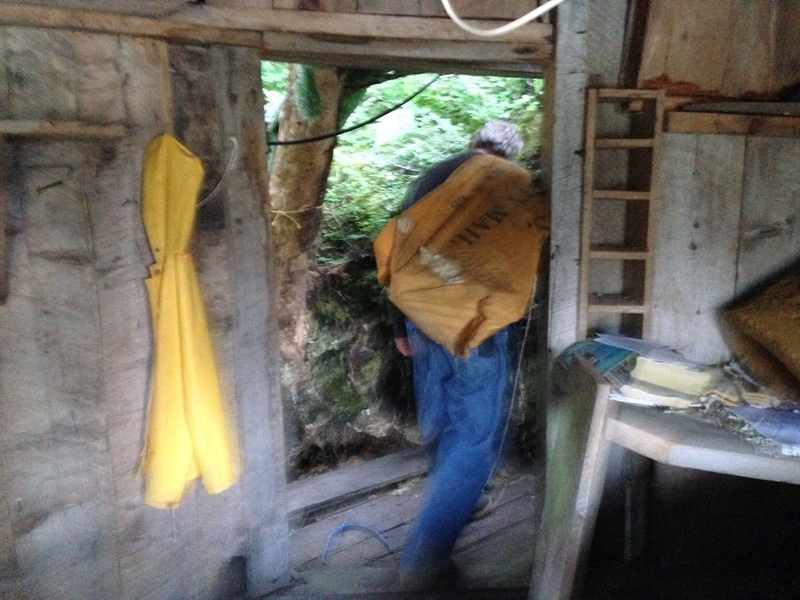 Like a seafaring Santa Claus, Seaman shoulders his sack and heads back to the mail boat. Photo: Shady Grove Oliver/KBBI. We head down to the harbor and onto his old, green and white beast of a boat. As soon as we’re out on open water, he relaxes and starts to smile. The mail shed is a shack-like cabin haphazardly perched on a steep incline not too far above the water. A fish tote serves as a mail receptacle. Photo: Shady Grove Oliver/KBBI. 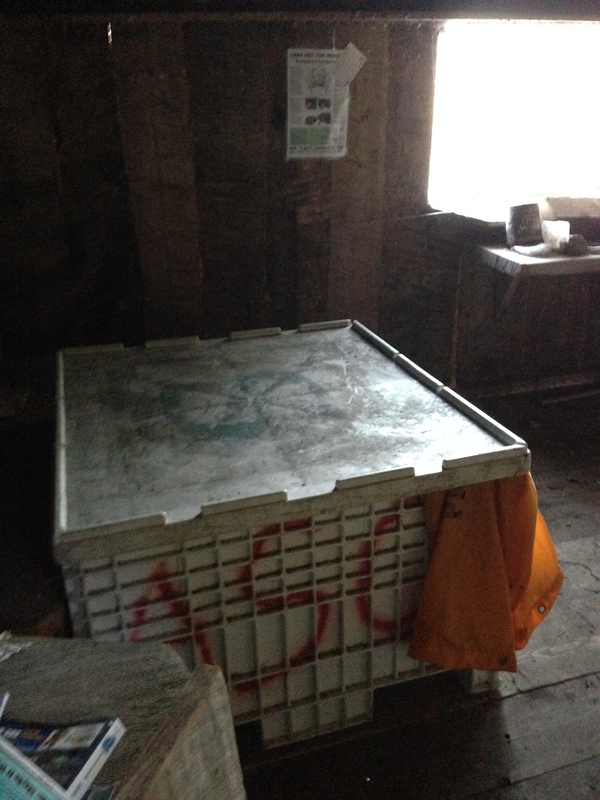 Inside the shack, there’s a big fish tote. He’s lucky that today there’s only a handful of mail. He once served as the de facto moving company for a family coming from Bethel, hauling everything from the boat to the shack. Once he’s done, he hops down. Back on the beach Seaman stops and looks around. He and his job make sense for each other. 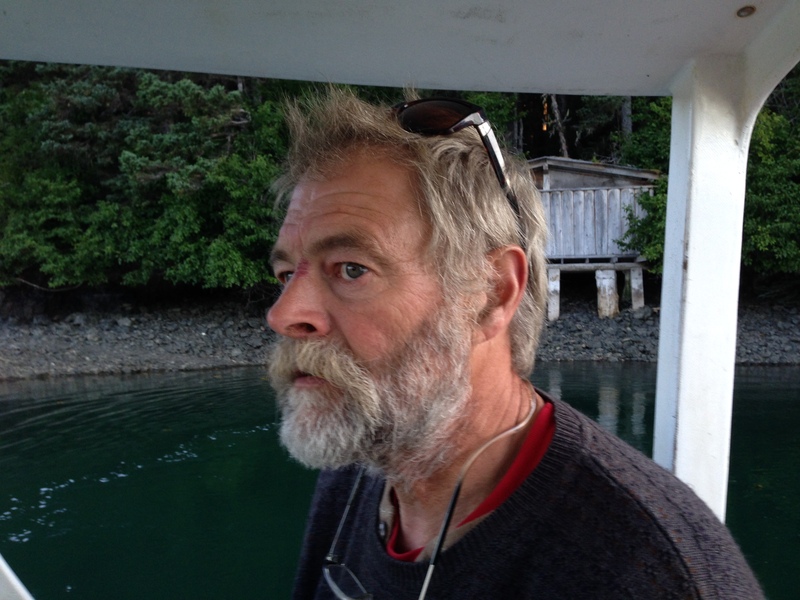 When he’s not working he builds boats and lives in a small cabin off a lagoon. He says his job pays for his boat habit, keeps him connected to his neighbors and friends, and allows him to give back to his community. And he believes in mail. It’s more personal, perhaps more genuine, it’s managed to hang on through the hustle and bustle of modern life. Little Tutka resident Gregor Welpton agrees. Back on the shore, it’s time to head out. Seaman still has some letters for his neighbors, like Gregor, that he’ll hand deliver on his way back home to his little cabin. We haul ourselves back onto the bow of his boat. As he starts it up, he bemoans the loss of the old Little Tutka mailing address once again – Red Mountain via Homer replaced by plain old RDO, the code for the nearest air strip, miles away. He says he’ll do this job until the day he dies, providing an important connection for the folks who live out here, hoping they won’t have to get too much more connected, though, as the years go by.